Interoperability in healthcare includes both complete access to essential clinical and diagnostic data that is appropriately aggregated and normalized for meaningful use in clinical decision-making by physicians and providers, as well as healthcare analytics and predictive modelling programs used towards improving population health and disease management. Physicians, health systems, accountable care and health insurance organizations and other medical stakeholders are striving to access significant amounts of aggregated clinical information for analysis for care planning and management. They need to share this data across the collective community of care and illuminate patterns for optimal analysis; blending biostatistics, bioinformatics, information technology, data analysis, and clinical research. Actionable and complete clinical data has the potential to transform the process of clinical decision-making improve healthcare practices, reduce costs and ultimately improve population health overall. Further necessitating the need to access complete clinical data is the fact that reimbursements are being tied directly to the demonstration of quality care as measured by this data. And what accounts for the bulk of this data? It is laboratory, pathology and other diagnostic testing results. 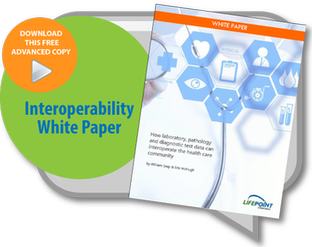 It is believed that up to 70% of critical decisions in diagnosis and treatment involve quantifiable laboratory data. (1) The hope for improved population health is in accessing the information from these growing data repositories—including lab and diagnostic test results—and analyzing them with intelligent software solutions to strengthen the evidence base across the healthcare spectrum. READ MORE BY DOWNLOADING OUR FREE WHITE PAPER.